The shared character creation thread. If you are Benedict, EinBein, ThirtyThr33, Nemedeus, or Taelor, you can post here freely. They get first dibs on the campaign, 'cause I already left them hanging once. If any of those guys back out or don't respond after a few days, we'll take on new people. Ok, throwing my two cents here before we start making characters. I have two ideas that I'd be really interested in playing. 1. A female Hound that is a master of disguise, espionage, and poisons; and medicine by extent. Most people (many Hounds included) think she is a man, and she regularly changes identities. Only a few people know of her true identity, as she has a dark secret in her past. Her motivation is protecting the Empire and her secret. And the thrill of outwitting her enemies. 2. An unscrupulous, loud, and boorish mercenary swordsman who's in it for the money. He's no Hound, but he excells at fighting, and has served the Hounds on numerous occassions for the right price. In truth, he might even sell his mother to slavery, if the price was right. His main motivations would be greed and the thrill of the fight. Thx in advance for the feedback. Sounds kinda similar to my character from the previous attempt at the game. I'm not super attached to the concept, though. If you want it, I can make someone else. Tbf its nearly 2 years since that first batch of Hounds and only remembered that nemedeus had that Silverwolf lady char. It's true that my idea resembles Lafluer, but only to the point they are both women and hounds. Anyway, I ain't super-attached to any concept myself either. Just kicking around ideas to get things started. I was mainly referring to the sneaky espianage thing. But I'll probably be switching to a different character. I like the portrait I originally chose for Franz-Theodor. Also the concept of a shady drunkard who‘s serving the hounds but maybe not always as they expect. So I‘d play the local guide who‘s never detached from the common men of the bogs (or wherever we play) in terms of status or education. Or ideology for that matter. In terms of game statistics, I‘m quite flexible. Depending on what‘s needed he could be a really good fighter or more of a supporter with some sneaking and ranged skills. Whatever you come up with, I‘ll see how I can fit in. Last edited by EinBein on 28 Jan 2019, 00:06, edited 1 time in total. Yeah, don't in any way feel beholden to the characters you lot pitched way back when. I don't have a huge amount of preference what you guys decide to play as so long as at least one person is a Hound. Two players as Hounds, one being the Master the other being an Acolyte trying to earn his stripes. A lot of fun can come from an apprenticeship dynamic, particularly when the former is responsible for the latter and the latter is trying to impress the former. A PC as a Hound on their first solo mission after earning their seal. In this case, the character has an excuse for the kind of learning curve for the player will themselves have in learning the ropes/making mistakes. Religion is also an interesting angle, so having at least one religious character would be a fun way to play it and invite other kinds of conflicts. The three-fold mandate thing is nice because it gives us a thing that exists in the fiction that expresses three major themes to be explored and exploited. What did you lot decide? I'd like each of you to do a quick post introducing the broad strokes of your character -- or the characters you're considering, if you haven't decided yet. I'd like to start this up soon. Franz ’the dog’ Torfer is a tall, wiry man, cloathed in a filthy army uniform. He sports proud Usipetic side whiskers and a similar moustache, though both have seen better (and cleaner) days. The stubble on his chin is split by a pale skar, his neck is covered by a flaky rash, his face pitted and bruised. When he walks, he sways like a landrat on a ship during a thunderstorm. He smells of booze and dirt. He‘s worked for a hound named Elaine in the past (no Buffy, rather imagine female Glokta), but turned on her for unknown reasons, informing the Ordo of her (yet undefined) treason for reasons only he knows about. The night he fled from her camp, he was ambushed by other servants and left for dead afterwards. Only the skilled treatment of Benedict‘s char (for the lack of a name) ensured his slow recovery. Now he‘s been appointed a new master. Any further links can be established when other characters join the fray. Last edited by EinBein on 11 Feb 2019, 12:47, edited 2 times in total. My character is a jaded veteran hound. He has a deep dislike for the imperial bureaucracy, but feels he can do the most good working within the system. The lore dump talks about how the hounds have a dual purpose: keeping the peace, and serving as the emperors eyes and ears. My character is a skilled investigator, which is why he was accepted into the hounds, but he sees the former role, of keeping the peace, as being more important. Agility 4, Brawn 4, Cunning 6, Perception 7, Will 6. Grit 5, Keen 6, Reflex 5, Speed 4. Negotiation 6, Command 5, Education 4, Lore (Law) 4 Manipulation 4, Politics 3, Streetwise 3, Network 3. 3D Ordo Canisque, 2D Bond: Sister (minor, immediate family, wife of a high ranking imperial bureaucrat), 1D Shrewed Judge of Character, OD Son of a Imperial City Constable, 0D Dislike of Bureaucracy. 2d Bond [to Taelor] : (Taelor's character) knows my secret and my real name. We were past associates and worked together on numerous occasions. 2d Bond [from EinBein] : I have dirt on Franz and Elaine. Treated Franz of some grave injuries; during his delerium I listened to his raving. He also respects me for saving his life. 2d Bond [to thirtythr33] : I like this young man enough to care about him spending a life of misery as a Hound. 2d Bond [from thirtythr33] : I nursed his mother back to health during the plague outbreak. I can see he feels indebted to me. I have done things I regret as a Hound. My medical skill is a way to atone myself. Used to be a woodsman, mostly hunting and trapping small game for food and fur, occasionally doing work in larger hunts for nobles when they needed more men. When the sickness swept through, he lost his sister. 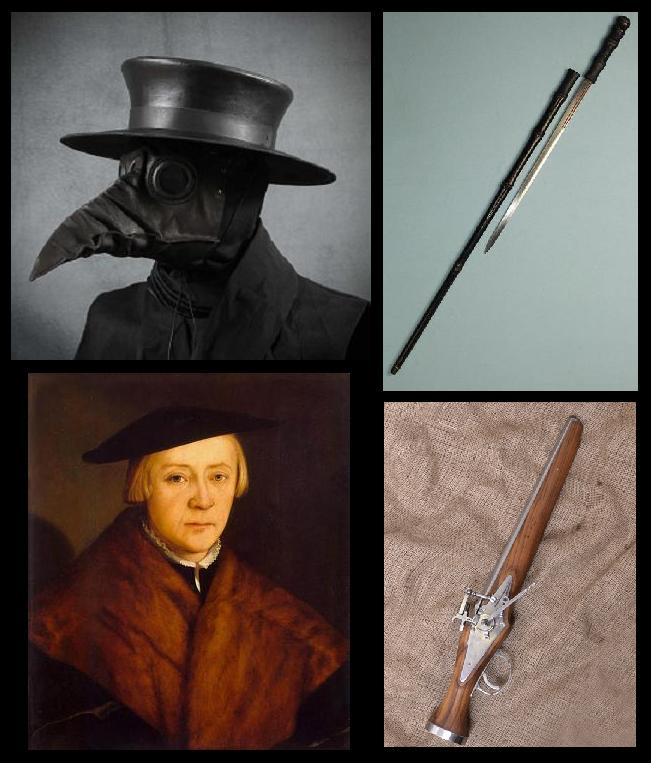 Armand, the plague doctor, saved his mother; a debt he never found an opportunity to repay. Later he caught the eye of some Hound scout for his outdoor skills and skilled use of a rifle. Since taking apprenticeship with the hounds he has been struggling with the idea of some of the duties and obligations he will have to carry out. Although a skilled huntsman, he has never killed a man. A middle aged man with dark circles under his eyes and hunched posture, beginning to gray and bald. A former commoner from the gutter who grew up on the rough streets of the capital, fighting in brutal gang warfare after his mother died of plague. He is a hard, and ruthless man, who seems to strive to rid the Empire of the very filth he formerly called comrades, after seeing the worst that the Empire's seedy underbelly had to offer: gangs, syndicates, and cults of the worst magnitude. He seems to exude an aura of constant grim determination. Sorry it took so long, guys!